Welcome to Prepped & Pretty, a new series of blog posts that will teach you how to prepare and style your hair and makeup for performing. We all love to get dolled up to perform, but many venues and events (including Nightcap) will ask you to arrive with hair and makeup ready to save time and space. As backstage areas are often dark, crowded and frantic, preparing as much as you possibly can at home will help you to feel calm and ready-to-go on the night. In Part One of Prepped & Pretty, we showed you how you can use foam rollers to set your hair and create gorgeous, vintage-style curls. This “wet-set” method works well for even the most stubbornly straight hair, and doesn’t damage hair with heated tools. If you haven’t seen it yet, you can check out the blog post and video here! This week, we are going to show you how to take those gorgeous wet-set curls, and brush them out into a vintage hairstyle, inspired by icons like Marilyn Monroe, Betty Grable and Dita Von Teese. This method works best for short to medium length hair, but long-haired babes will be able to use the same principles to create a beautiful, vintage style. Disclaimer: I am an amateur hairstyling enthusiast/not a hairdresser. This is the method that works for me, but there are many different ways to achieve this look. Remove your rollers, one by one, starting at the bottom. If you have done a wet-set, it’s a good idea to unwind a single roller to check that your hair has dried completely. Remove all of the rollers, leaving the curls as they fall. 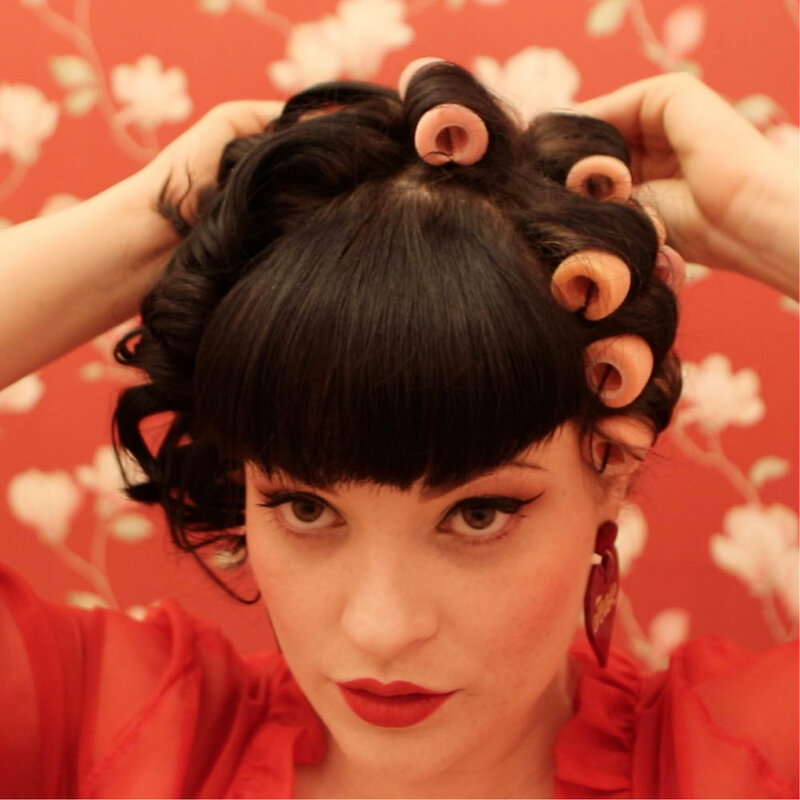 Once all of the rollers are out, comb your fingers through your hair to separate the curls. You will look a little bit like Shirley Temple at this stage, but don’t worry! We’re going to tame those curls! Take a brush with soft bristles (it’s better to use this style than a harder plastic brush, or one with the beads on the tips) and start to brush through your hair. Brush your hair gently, to encourage the hair to become smooth. Notice the way the curls start to fall, and which direction they are falling. This is the direction that you are going to shape your curls into. Section your hair into smaller sections, about a handful or so. Brush through the hair with your brush, encouraging the curl to create a smooth, soft shape. Repeat this step with each section of hair, shaping the curls as they fall. Brush the ends of your hair so that they roll underneath towards your neck. To frame your face, we’re going to tease the roots to give some volume. Take a smaller section of hair and hold it up, spraying with a little hairspray. Use your teasing comb to push the hair back towards the roots. Repeat this on the rest of the hair in that section. Once you have teased each section, you can use your brush to smooth the hair back over to the side. Brush gently to avoid undoing all that teasing! To shape those curls around your face, start to move them where you would like them to sit. When you get them into position, use a large clip to clip them in place. Shape the entire length of the curl, finishing by curling the ends underneath with the rest of your hair, or off towards the back of your head. If you don’t have a fringe, you can use this same method with the very front section of your hair, letting it swoop down over your forehead, or pinning it into a roll. With the clips in, lightly spray all of your hair with hairspray. You can use your fingers or the comb to gently smooth any frizz or flyaways around your curls. Wait until the hairspray has dried completely before removing the clips. If those curls just won’t stay where they are put, you can use bobby pins to secure them in a concealed way. Touch up during the day with hairspray and your smoothing comb if necessary. Stay tuned for Part Three of Prepped & Pretty, where we will show you what you should bring with you for a performance!